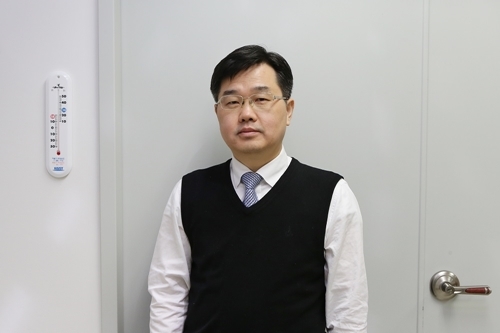 A KAIST research team made it one step closer to realizing safe energy storage with high energy density, high power density, and a longer cycle life. This hybrid storage alternative shows power density 100 times faster than conventional batteries, allowing it to be charged within a few seconds. Hence, it is suitable for small portable electronic devices. Conventional electrochemical energy storage systems, including lithium-ion batteries (LIBs), have a high voltage range and energy density, but are subject to safety issues raised by flammable organic electrolytes, which are used to ensure the beneficial properties. Additionally, they suffer from slow electrochemical reaction rates, which lead to a poor charging rate and low power density with a capacity that fades quickly, resulting in a short cycle life. On the other hand, capacitors based on aqueous electrolytes are receiving a great deal of attention because they are considered to be safe and environmentally friendly alternatives. However, aqueous electrolytes lag behind energy storage systems based on organic electrolytes in terms of energy density due to their limited voltage range and low capacitance. Hence, developing aqueous energy storage with high energy density and a long cycle life in addition to the high power density that enables fast charging is the most challenging task for advancing next-generation electrochemical energy storage devices. Here, Professor Jeung Ku Kang from the Graduate School of Energy, Environment, Water and Sustainability and his team developed an aqueous hybrid capacitor (AHC) that boasts high energy density, high power, and excellent cycle stability by synthesizing two types of porous metal oxide nanoclusters on graphene to create positive and negative electrodes for AHCs. The porous metal oxide nanoparticles are composed of nanoclusters as small as two to three nanometers and have mesopores that are smaller than five nanometers. In these porous structures, ions can be rapidly transferred to the material surfaces and a large number of ions can be stored inside the metal oxide particles very quickly due to their small particle size and large surface area. 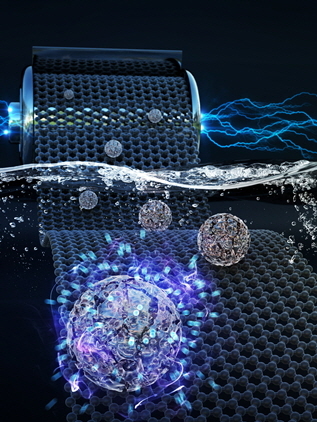 The team applied porous manganese oxide on graphene for positive electrodes and porous iron oxide on graphene for negative electrodes to design an aqueous hybrid capacitor that can operate at an extended voltage range of 2V. This research, co-led by Professor Hyung Mo Jeong from Kangwon National University, was published in Advanced Functional Materials on August 15, 2018.